Why go tubeless on a road bike? Improved grip – tubeless tyres can run at lower pressures without pinch flatting (as there is no innertube to receive a pinch flat.) Lower pressures and more supple tyres also improve grip (tyres can be more supple without innertubes behind them). Greater comfort – lower tyres pressures provide greater comfort. Lower rolling resistance – innertubes increase the rolling resistance of the tyre system. Going tubeless, you immediately eliminate the pinch flat puncture. You also have defense against a puncture caused by penetration from a foreign object. If a thorn or piece of glass or similar go into the tyre, the sealant can rush out through the hole and seal it shut. The repair, which requires no rider input, should last the life of the tyre. Sometimes if the hole is too big, the sealant cannot heal it; sometimes that can be repaired with a tubeless repair kit, sometimes the tyre has to be replaced. 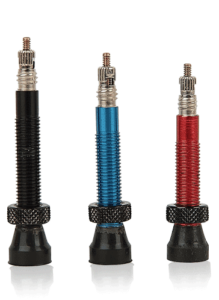 How do I set up tubeless to begin with? You need a tubeless compatible rim. All DCR rims are tubeless compatible. Most of the wheels we sell are. You must have tubeless tape unless you are using a UST rim. 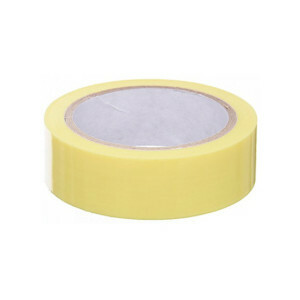 Tubeless tape is the best tape to use with a tubeless rim, it make any tyre easier to fit. Normally two layers is best. You need to have tubeless valves installed. 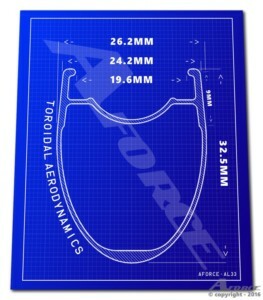 Our own range of valves can be used with all of our rims and most other rims too. Being alloy they are about 50% the weight of a brass valve; they have a rubber washer for better sealing and to prevent rim damage. They are also available in colours. Once the tape is fitted, make a hole for the valve. Do this with a sharp blade. You can trim the tape down with a needle file here if you wish to create a neat hole, or a few slits in the tape will suffice to get the valve through. Do that up fairly tight but without the use of tools. A tubeless tyre. Either road tubeless or tubeless ready. Tubeless sealant. We recommend Hutchinson Protect Air max – it seals and lasts well. For best sealing use Orange Seal. We carry seven different sealants if you prefer something else. Start with a clean setup. Install the tyre on one side, and add sealant (30ml+ on 25c and more on larger tyres – more sealant helps sealing and longevity but adds weight). Fit the other side and inflate. On a 25c tyre you should hear some loud bangs at about 8opsi, any leaks should disappear at this point. Shake the wheel around to disperse the sealant. The seal will improve over time, revolving the tyre helps. An additional layer of tape often helps. It is best to have 2 or 3, more can make the fit very tight and you may have other problems. 1 layer can work but is often not enough. Your tape may be too wide or narrow – use the recommended width for your rim. Are your valves tight? Loose valves alloy air to escape. Ensure the setup is clean. Is the tyre sitting over the valve, if the tyre sits next to the valve, no air goes into it! Using an air compressor allows you to deliver air faster. A CO2 inflator can work too but is wasteful and costly and can affect the sealant. We sell inflation devices, expect to pay around £50-80 for a decent one. 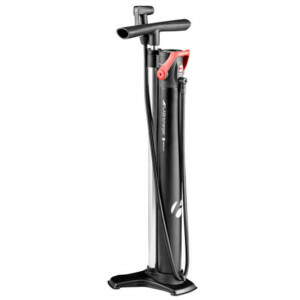 You need a good pump for setting up tubeless. The faster the air goes in, the easier the setup. It is easier if you remove the core of the valve to allow more air through faster. You can also encourage the bead of the tyre closer to the edge of the rim to reduce the air coming out. If air escapes from the tyre too rapidly to seat the tyre, fit an innertube and seat it. Then deflate, unseat one side of the tyre and then reapply sealant. When adding pressure again there will be fewer leaks making it easier to achieve a full seal. A seated tyre may still go down either readily or gradually. Gradual leaks should will seal better and better over time as the sealant finds holes. Plenty of shaking helps during the initial setup. What happens if on a ride I have a puncture that will not heal? If you ride a tubeless tyre for long enough – this will happen. The two most common causes of punctures which fail to heal are either that your sealant has dried/run out or that the hole in the tyre is too large for the sealant to heal it. So what can you do in this situation? Prevention is the better path. Familiarise yourself with the lifespan of your sealant. In our experience, despite claims, all sealants dry out. Nevertheless they dry out at different rates. When your sealant is dry, it cannot seal your puncture. If you ride infrequently, use long life sealant. Riders who do very high mileage and receive a lot of punctures should use the highest performing sealant. To check if a sealant has dried or run out, revolve the wheel so the valve is at the bottom. Remove the valve core and dip a rod down through the valve like a dipstick in a car. That will give you an indicative sealant level – if your rod comes out dry your sealant has either dried out or run out. More sealant can be inserted using an injector through the valve. This prevents the need to remove/reseat/reseal the tyre. It is worth checking your sealant level if a significant amount has coming out from punctures, or if is old enough to dry out. Sealants dry out faster in hotter conditions, so you will need to top up more regularly in the summer than winter. If you are stuck at the side of the road with a punctured tyre and no sealant, you can remove any sharp objects and fit an innertube. If the sealant is failing to seal the puncture, be patient, most punctures heal without the rider even noticing. Those more severe than that heal quickly without any need to slow down and with minimal loss of pressure. Sometimes significant pressure is lost but a seal is achieved without stopping. The next level is generally one that requires some patience, so you can stop and rotate the wheel so the sealant pools over the affected area to give it the best chance to seal the hole. Sealants work better at lower pressures, so road pressures make their life harder – as the tyre deflates from puncture, it will increase its chances of healing. If it seals only at a very low pressure, it is worth waiting a moment for the sealant to dry/create a better seal. Sometimes low pressures are required indefinitely which should hopefully be enough to get you home, it is possible that once the seal has settled, pressures can be returned to normal without any issue. What if the sealant is fine but the puncture still does not heal? In the event that a tyre entirely deflates because there is a large, irreparable hole in the tyre, simply remove any offending objects and insert/inflate an innertube to get you home. This may be a bit messy but is simply like repairing a puncture pre-tubeless. In the event that the hole is large enough for the innertube to poke through the tyre, some sort of boot is adviseable, if you are without a boot in your kit, you can improvise with any durable plastic/equivalent – a bank note, an energy gel wrapper or even a crisp packet could be enough to get you home. These are of course less than ideal scenarios but there almost always a way to get home as long as you have a pump, levers and a tube. These are difficult questions to ask as the answer is personal. Once you have understood the process, tubeless tyre maintenance is easy. Some people will continue to opt for puncture protective tyres, which does work as an effective solution against punctures. However, puncture protective tyres are a lot slower than racier tyres, so if you do not want to deal with punctures at the side of the road and you do not want to ride a slow tyre – tubeless is your best option. There are tough tubeless tyres on the market too now, to give you the best possible chance of not even needing to resort to using the sealant inside. It may also be that owing to your location, riding style and road surfaces, that punctures are exceptionally rare anyway, in which case tubeless may be more complicated to set up, require a degree of maintenance and offer very little benefit in term of puncture avoidance. Tubeless still has a lovely ride quality, however the strongest candidate for tubeless is a rider who likes riding high performance tyres and regularly receives punctures. Yes. Especially if you compare it to the cost of economical tyres – if you historically purchased high performance tyres, the differences in price are smaller. We offer a tubeless setup including tape/cores/sealant/Hutchinson Performance tyres for £90 for a pair of wheels. What is the difference between the tubeless standards? Sealed rim beds (beds without spoke holes) can have tyres fitted without rim tape. Here, you only need a valve, sealant and tyre. Some tyres are ‘road tubeless’ some are ‘road tubeless ready’. Tubeless ready tyres differ from tubeless tyres because they are not sealed themselves. e. if you fitted one to a rim, it would gradually go down as they have no airtight seal. Tubeless ready tyres require a sealant to create an airtight seal. If all else is equal, tubeless ready tyres are lighter than tubeless tyres but are a newer standard. Tyre manufacturers do not agree on the best way to make a tubeless tyre, so you will find that each fit in slightly different ways, bead material construction and diameter vary. So you may find it hard to fit brand X to one rim and easy to fit brand Y to another. We have found Hutchinson tyres to be among the easiest to both fit and refit and recommend their tubeless ready tyres. The Continental 5000 tyre is also a good tyre for fit/removal/refitting. What if I do not want to run tubeless anymore? 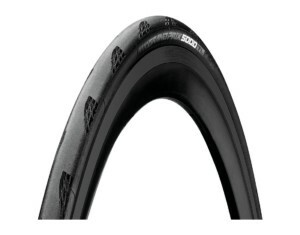 Riders can run a tubeless tyre and rim indefinitely with an innertube if preferred. Almost without exception, a tubeless rim can also accept a conventional tyre, so having wheels which give you the option of running tubeless still allows for a traditional setup.